If no news is good news then good news is fake news. Jonathan Pie returns to the road once more to berate the people in power – and the journalists holding them to account. Jonathan Pie is a fictitious exasperated news reporter played by actor and comedian Tom Walker. His videos have been seen across the world. His previous two tours have taken in venues such as the Hammersmith Apollo and the London Palladium and performances across the US and Australia. Jonathan Pie has been described as "brilliant, brave, raw and analytical without forgetting to be funny" by Ricky Gervais. With over 1.2 million Facebook followers, his videos regularly achieve millions of views going viral internationally. His response to the election of Donald Trump was viewed more than 150 million times worldwide. 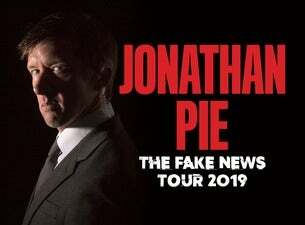 Catch Jonathan Pie: The Fake News Tour at cities across the UK this October and November.